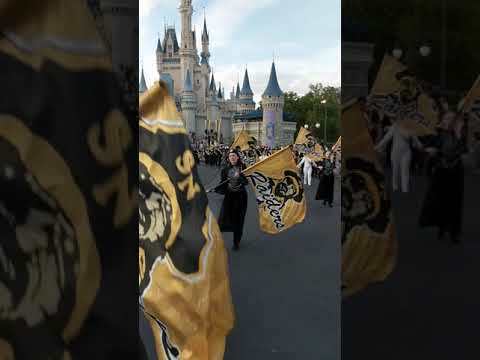 ORLANDO — Sullivan North High School’s “Band of Gold” is back from its trip to Florida to perform at Disney World’s Main Street USA parade. Put another way, Chip ‘n’ Dale met some folks from Bloomingdale this past weekend. The band pulled back into the North parking lot Wednesday morning after an all-night drive from Florida. “It was an awesome trip, really no problems,” Band Director Nick Routh (pronounced like “Ruth”) said Wednesday evening after catching some sleep earlier in the day. More than 50 band members and about 20 adult chaperones went on the trip, with the students and director in a chartered bus and the parents in two vans. She said the park announced the bands that were performing that day throughout the park. “They knew we were from Sullivan North and Bloomingdale,” Stratton said. Routh said that the park used loudspeakers along the parade route to announce the name of the band and where the school was. Senior Madison Smith, trumpet section leader, said the parade route went from Splash Mountain, near Frontier Land, to the entrance of the Magic Kingdom. Stratton said all band members got a set of Mickey Mouse ears and the band got a trophy. “I hope next time I get to go to Disney I get to go to Hollywood Studios,” Stratton said. The band rode overnight on a chartered bus starting Friday evening, visited the Animal Kingdom on Saturday, went to the Magic Kingdom and marched on Sunday, visited Daytona Beach on Monday and then went to Epcot on Tuesday before heading back home that night, arriving back in Kingsport at about 11 a.m. Wednesday.